It’s been a few months since we’ve reported numbers for the Current Market Index, so here is the update. 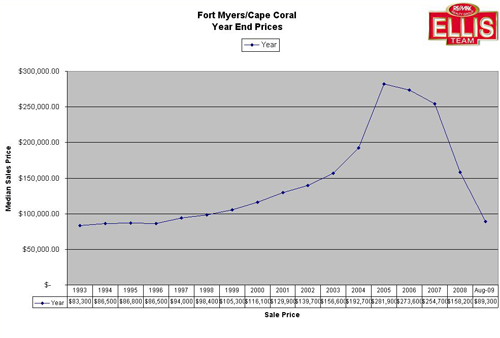 The Fort Myers-Cape Coral area index now stands at 4.02, up slightly from 3.86 in September and 3.81 in August. The lower the index numbers the better the market for sellers. This is a result of slightly rising inventory numbers, but very much in line with inventory numbers back in August. We’ve seen continuous dips in inventory for quite a few months leading up to October, and this is the first month we’ve seen a slight increase. Pending sales are down ever so slightly as well, however nothing that is statistically significant. Existing sales are holding up nicely and still showing healthy gains over last year. Buyer interest from around the country is strong. In fact, our team has so many buyer leads coming in that we need to hire 4 more buyer agents to keep up with the activity. We think season this year is going to be very strong. Temperatures up north have been unseasonably cold this fall and it’s looking like they could have a long and cold winter. Traditionally this is always good for the Florida market as snow-birds look for a tropical escape and potential property purchase. The snow-birds we’ve talked to are already motivated to purchase. They witnessed first hand that some properties are up about 20% in price over last year as the pickings are getting slim in certain segments. They realize this season may be the last season to pickup many of these bargain basement priced properties. We’re seeing waterfront properties in the Cape for example bouncing off their bottom last year for entry level direct access properties. We’ve also seen a bottom in Cape Coral for entry level homes, especially pool homes. This has fueled an increase in sales in the Fort Myers and Lehigh Acres market. Fort Myers home sales in September increased by 6 sales. Cape Coral lost 35 sales versus the previous month. Lehigh Acres gained 7 sales versus September. As sales potentially shift from the Cape over to Fort Myers and Lehigh Acres, we could see a bottoming in prices there as well. You’ve heard the term that water seeks it’s own level. As prices get too high in a given area, buyers shift their focus to other more affordable areas. Many have preferred to live in Cape Coral over Lehigh Acres, but in the run-up back in the early 2000’s, prices in the Cape got so far ahead of Lehigh Acres that buyers shifted to Lehigh for the value, and thus a boom began in Lehigh. As foreclosures hit hard, many buyers scooped back into the Cape for the bargains and preferred the Cape over Lehigh all else being equal. Because we’ve sold many of the Cape foreclosures, the bargains are not there like they used to be, so we’re seeing this shift to wherever the bargains are. We’re still in a bargain market for the time being, but that could change. Northerners are starting to fear that the bargains are drying up and they don’t want to miss out, so this season could get very exciting. It’ll be interesting to watch where the money goes, and what happens when the foreclosure well starts to run dry. How will that affect the overall market? Speaking of foreclosures, it appears banks are cranking up the process on a whole new batch of foreclosures. Some have speculated that banks purposely waited until the end of 4th qtr which ended Sept 30 to file these new lawsuits so their books would look better. Wall Street has a history of doing this for earnings and results. A friend of mine has even speculated banks are keeping losses off their books this year to pad their earnings so they can collect bigger bonuses. There may be some truth to that. Last year we saw a spike in Lis Pendens filings for precisely the same theory. We’ll have to watch the November and December filings to get a feeling if this is another Wall St accounting trick of holding back what they can, and thus the October spike, or if this is a long-term trend. If this is a long-term trend, then it will stall increase in prices. If this is merely a short-term blip like last year, we could see fewer bargains and more actions from northerners fearful for missing out on one of the best buying opportunities in awhile. Just like back in 2005, you cannot calculate the absolute top of the market until it’s in your rear view mirror. Timing the bottom of the market is much the same way, and in fact we’ve seen a bottom already in certain segments. The entire market doesn’t always move in unison. Our advice to buyers is simple. Regardless of whether this is the absolute bottom, we’ve already seen the bottom, or we have a little bit more to go, prices are bargains right now. You may not want to miss this general time period, because one day soon we may look in the rear view mirror and kick ourselves for missing the buying opportunity of a lifetime. All the bank’s misery and misfortune can now become your gain. Somebody is going to capitalize on this misfortune. Why not you? A few weeks ago we stated here that we believe there will be more mid to upper priced foreclosures coming to the market in the next year, as more Alt-A mortgages are foreclosed on as scheduled interest rate resets take effect. We’ve seen most of the sub prime loans already come and go from the market. So the next wave should be the Alt-A and the economy driven foreclosures as regular people who have lost their jobs due to the falling economy begin to stop paying. We based this upon a graph in our State of the Market Report published last January. 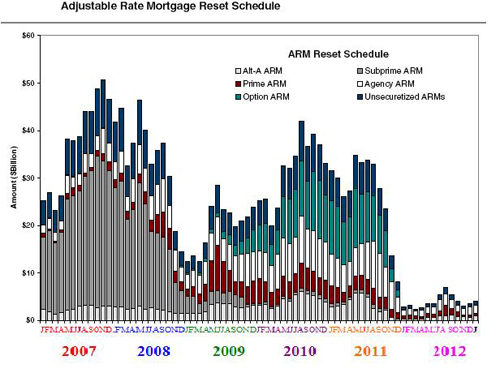 You can view this graph in greater detail and in color on our Blog at http://ellis.realty-buzz.com or visit our Fan Page on Facebook at www.Facebook.com/Ellisteam As you can see by the chart, Option Arms are scheduled to reset at their highest point about August of 2010. A feature of the Pay Option Arm is that borrowers are allowed to pick a payment, meaning they can pay any one of several payment options. These loans began with low teaser rates, and one of the ways they allowed borrowers to minimize their payment was by allowing the buyer an option to make a payment less than the “Interest Only” portion of what the loan would have been. These types of loans are called “Negative Amortization” because each month the borrower is losing equity. Pay Option Arms were used primarily by borrowers who wanted to maximize their purchasing power by leveraging as much as the banks would lend with the absolute minimum payments. These buyers didn’t worry that they were getting further behind each month as they figured the home would appreciate faster than the negative equity would accrue due to the loan. Most of these borrowers planned to “flip” the property and make a fortune, then repeat the cycle all over again. In this cycle of irrational exuberance, few thought about when the musical chairs would run out. It seemed like that crazy market would last forever, until one day when the music died. You could see the train wreck that would one day ensue. Simultaneously, the value of the property is in free-fall and the loan amount is increasing by the month. You’ve heard the terms “Upside Down” and “Getting Hit at Both Ends”. This pretty much sums up what happened to Option Arm borrowers in heavily concentrated investment areas like many new subdivisions here in SW Florida. Have you ever wondered why certain established neighborhoods held their value fairly well through the downturn, while newer communities seemed to take it on the chin? The answer is investors and speculators flocked to newer construction, as this is where the perceived pre-construction deals were back in 2003-2005. The problem is we had too many speculators. Investors can be quite healthy for a market, but a speculator just drives up prices for the sole purpose of Flipping to another buyer. The only useful purpose this would serve is providing the capital to speed up construction to provide much needed supply due to high levels of demand. The problem is, we had phantom demand. Our market sped up the supply side without real end users. There’s something not quite right when the end user is another speculator buying to flip same property for a 3rd or 4th time to another speculator. Eventually the music dies and the musical chairs run out, except this is real life and not fun and games. The rest of us have been picking up the pieces from this sad game, and we’ve all paid a price. Construction jobs have left, values have plunged, banks have failed, taxpayers have paid for a bailout, and just about everyone that played the game is sorry. Many of these Option Arm’s have already defaulted as the speculators learned early on they couldn’t flip the property for a profit, so they quit making payments. We do believe there are some regular buyers who also used the Option Arms to purchase more home, and some have been hanging on for as long as they can because they can’t afford to sell their home. Once these payments reset, we could see another round of foreclosures hit the market. These buyers tended to buy the mid and upper tier homes. This is one reason we predict you’ll see more higher priced homes coming out of the foreclosure pipeline. We’ve seen the foreclosure pipeline growing in the past few months, and due to processing delays, we expect several foreclosures to start hitting the market this month. Filings are down, so the foreclosures coming out now were backlogged from back in December and January. The resets in 2010 and 2011 will also take awhile to work their way through the system, so bottom line is we’ll see a certain amount of foreclosures for the next several years. The sooner we clean them up and ship them out the sooner we’ll be on our way to a normal market, so I say bring them on without delays, so we can all get back to listening to the music. Leave your chairs at home. Posted in Cape Coral Real Estate, Fort Myers Real Estate, Southwest Florida Real Estate, SW Florida Bank Foreclosures. This is another question we get asked a lot and the quick answer is value is in the eyes of the beholder. It also depends on who you ask. If you ask the seller, they’ll tell you about how they personally built the house, what kind of insulation is in the attic and walls, how many screws are holding up the shelves in the kitchen pantry, how they clean the solar panels on the pool twice per month for maximum longevity, how they just cleaned out the dryer vents, the fact that they imported fruit trees from Malaysia for maximum fruit yield, and the date and time each fruit tree was planted. All of these things carry emotional value to the seller and should equate to monetary value in the seller’s eyes. The lender wants to know how sound the buyer is, if the homeowners association is fiscally sound, and the opinion of value from the appraiser. The property appraiser looks at value from last year and tells you what they think your home used to be worth last January 1 based upon sales from last year. This is done on a mass-appraisal system because the property appraiser cannot possibly do a full-blown appraisal on all parcels in the county. While this is a monumental task, the property appraiser is at a big disadvantage ascertaining actual value on any one particular property because of the scope of the task. While we would never rely on the property appraiser’s assessment of value due to these issues, we are amazed at how many times they do a good job of getting in the ball-park or close to value, but they are subject to error because the values are based upon a previous time frame and done on a mass scale. This brings us to the last two people in the equation; buyers and appraisers. Buyers look at several homes and size them up against one another. Buyers are always on the lookout for property that meets their needs, and presents the best value to them. Typically they’ll make an offer on the best value property that meets their needs. They don’t often waste time by offering on over-priced properties; they go straight for their favorite and offer there. Only when negotiations fail on their favorite do they typically move on to their second choice, so over-priced sellers remain the bridesmaid instead of the bride. Lastly the appraiser becomes involved. Since May 1 there has been a new governmental rule in effect called the HVCC (Home Valuation Code of Conduct). It was intended to improve the appraisal system and provide more accurate appraisals, but as is anything government related, it’s been a disaster. Appraisals have been far from accurate, and you could easily argue that the mass appraisal system the local property appraisers system uses has been far more accurate than some of these appraisals. The HVCC setup a management company to act as a middle-man so to speak. Costs to consumers have gone up, and turn around times have increased. The lowest priced appraisers have gotten many of the orders, so consequently many appraisals have been handled by out-of-town appraisers unfamiliar with our local values. The management companies give appraisers little time to do their work-typically 2 days, but appraisals take sometimes weeks to receive back because the middle-man has to review them. FHA accounts for 70% of the financing today, and if you get a bad appraisal you’re stuck with that value for 6 months under FHA. We’ve seen many properties under-appraising by $70,000 and more. The sad thing is the buyer wants to buy the property, and the sellers wants to sell, but the faulty appraisals are preventing not only the current buyer, but also future buyers from purchasing the property. It is literally forcing many properties into foreclosure. You can literally blame the Federal government since May 1 for wrecking our market. Oh, we can’t blame them for all the faults leading up to May 1, but we’re in serious recovery mode right now and the new HVCC system is preventing prices from moving when they should, and sales from occurring when buyers and sellers want to do business. The banks are powerless. Even though they want to lend money to a qualified buyer, the faulty appraisals are preventing it, and appealing the process is almost futile. A loan officer cannot speak with an appraiser, and the appraiser has total control, even when facts are presented clearly showing value is present. We recently had an appraisal done where the appraiser would not use a comparable two houses down, but preferred to use a foreclosure two neighborhoods over. The neighborhoods were not the same. The appraisers are so afraid a bank may come back on them later that they’ve gotten too conservative, and many times use poor condition and gutted properties against good condition properties. Appraisers should be worried buyers could sue them to level the playing field, and in fact one state has introduced a law stating just that. Congress really needs to step in and fix this mess. The government created it through additional regulation, and the unintended consequences are wrecking the market, and this market needs help, not an outside entity kicking it when it’s down and trying to get up. 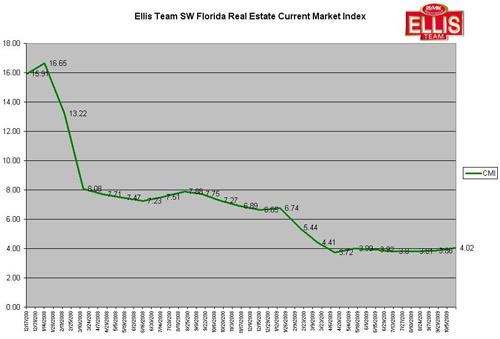 Are SW Florida Real Estate Prices on the Rise? The most asked question I get, both in daily business and on Facebook is, “Are prices about to spike up?” People are reading that inventory is shrinking, and buyers are buying all the foreclosures faster than the banks can bring them to market. People assume the foreclosure pool is diminishing and we’re about to run out, and of course they want to know how fast and how much prices will rise once that happens. It is true, to date buyers have been soaking up the incoming foreclosure inventory and whittling down the existing inventory. Banks have been allowing short sales to some degree for qualified sellers, and in some sub-markets we are running low on inventory. The chatter these days seems to be that prices are headed up in a big way, so let’s explore what’s really going on in the market today, and what may happen in the future and why. Median single family home sale prices have gone up for two straight months, but only marginally, up 1.25% in July and up .34% in August. The median sales price now stands at $89,300, up from $87,900 in June. Are all prices going up? The answer is no. The definition of median sales price is that half the sales occur over the stated number and half occur under, which now stands at $89,300. What is actually happening is the bottom has firmed up, and it’s getting tougher to find some of the bargain basement deals. Homes in Cape Coral under $90,000 are getting harder to find, as they were somewhat plentiful last year. The bargain deals have swung to Lehigh. The other interesting phenomenon is that mid and upper priced homes are falling in value. As these homes become bargains to their selective buyers, they are selling. As these mid and upper priced homes sell, they actually pull the median sales price up, even though those home prices are falling. Remember back to the definition of median sales price. In a few months people will start reading that prices are on the rise, when in fact prices are falling in the mid to upper tiers, and prices are rising in the lower tier. Very soon the median sales price may begin to rise as it gets hit from both sides of the curve, however when you read that prices are rising, you have to remember that all real estate is local, and even Lee County has submarkets that are different. In some cases properties are cash flowing for investors at today’s prices, which was unheard of in years past, even before the run-up. We believe now is an unprecedented time to be buying real estate in SW Florida as prices are so far below replacement cost that builders cannot compete, so building has been silent. We believe there will be more mid to upper priced foreclosures coming to the market in the next year, as more Alt-A mortgages are foreclosed on as scheduled interest rate resets take effect. We’ve seen most of the sub prime loans already come and go from the market, so the next wave should be the Alt-A and the economy driven foreclosures as regular people who have lost their jobs due to the falling economy. As you can see from the chart, median home sale prices are back to 1993 levels, but replacement costs to build are still at 2003 levels. Our market won’t fully take off until we reach equilibrium on a broader scale reaching not only the bottom tier, but also the mid to upper tiers as well. So the answer as to when will our market spike up to where it was at the height is complicated. The answer is it may never spike up to where it was, as those numbers were irrational and not supported by any sound financial basis. However, the opportunities that lay before us may also be unprecedented, and because of the over-correction of the market dues to the financial crisis, foreclosures, credit becoming scarce, and over-supply, prices in many sub-markets are already on the rise. Prices in the mid to upper markets will rise again; after they potentially fall some more, and the opportunity for home buyers to purchase at affordable prices and potential investment opportunities have many insiders excited. Remember the herd mentality. When prices are at their height, most think it’s the time to buy, and when prices are at their low, most believe the sky is falling and time to run for the hills. The smart money is back in, selectively, and they’re buying. The opportunities today exceed perhaps any other time in the last 40-50 years. So when you read, prices are falling, or prices are rising, be sure to dig deeper and analyze what it really means. Chances are, both statements are right, but in the analysis lies the true opportunity and wisdom.